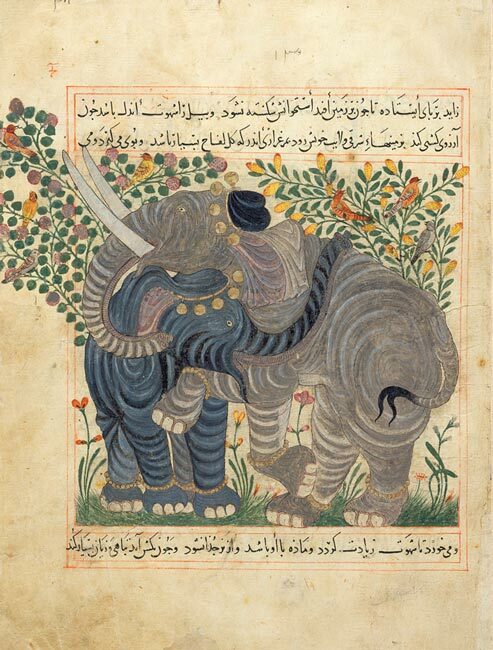 The two interlocking and rather affectionate elephants shown here make up one of the finest of the forty-four large illustrations in the manuscript Manāfi˓-i ḥayavān (The Benefits of Animals). They are royal elephants, as seen from their caps and the bells on their feet. The text describes both the habits and medicinal derivatives of the animal. Among the former, for example, it is stated that the tongue of the elephant is upside down, for if it were not, it could speak, and that the elephant was called "barrus on account of its voice, whence the voice is called baritone." Among the latter—and these have not been tested by the Morgan—are suggestions that elephant broth is good for colds and asthma, that elephant dung (taken with or without honey) prevents conception, and that one dram of ivory filings will bring about conception.